Daniel Ricciardo said farewell to Red Bull on Friday in his final official visit to the team's F1 factory in Milton Keynes. Daniel Ricciardo said his goodbyes to the Red Bull Formula 1 team on Friday in what was his final official appearance at its Milton Keynes headquarters. Ricciardo will leave Red Bull to make the switch to midfield leaders Renault for next season, having made his bombshell announcement after the Hungarian Grand Prix earlier this year. It marks the end of the Australian’s 10-year association with Red Bull that began when he joined its junior programme in 2008, before he progressed up the ranks via sister squad Toro Rosso to the Red Bull senior team in 2014. Ricciardo took seven victories and 29 podiums during his spell at Red Bull and capped off a frustrating 2018 season by finishing fourth in his last race for the team at the season-ending Abu Dhabi Grand Prix. On Friday, Ricciardo made his final official visit to Red Bull’s factory to bid farewell to the team and his colleagues. Upon his arrival, Ricciardo and teammate Max Verstappen rode around the team’s base on drift bikes, before completing an autograph signing session for team members that lasted two hours. The team’s regular post-race debrief followed, with team principal Christian Horner delivering his usual post-grand prix report as well as recapping Red Bull’s season as a whole. Verstappen and Ricciardo later joined Horner on stage as both drivers reminisced of their time together as teammates, while a ‘#CheersDan’ highlights reel was also played. Ricciardo also explained the origin behind some of his trademark exclamations including ‘Holy testicle Tuesday!’ from the film Ace Ventura and ‘Tripping major nutsack’. 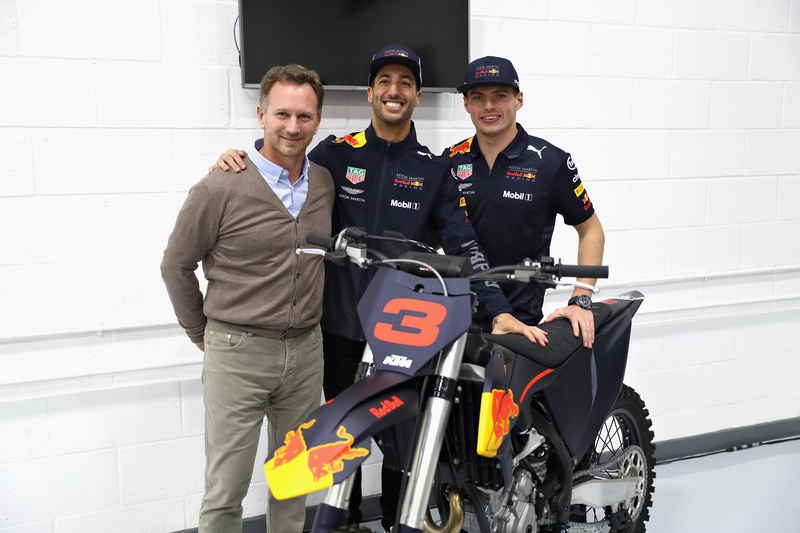 The day was concluded by Ricciardo being presented with a Red Bull-branded KTM 350 SXF motorbike – including his race number #3 – as a leaving gift.